Novak Djokovic took just 65 minutes to beat Malek Jaziri in straight sets to record his 700th tour level win. 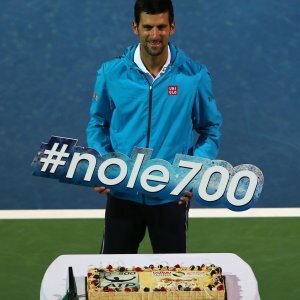 He becomes only the 12th man since 1968 to win 700 singles matches and celebrated on court after his victory. He was given a celebratory cake and posed for pictures as he celebrated this monumental achievement. He now sits just 13 wins behind Boris Becker, in 11th place on the list, and 62 wins behind Pete Sampras in tenth. It also makes him the third current ATP Tour player to reach the milestone, joining Rafael Nadal (775 wins) and Roger Federer (1,067 wins). The World number one is aiming for a fifth title in Dubai and will now move on to face Feliciano Lopez in the next round. Djokovic admitted being a little frustrated with his game during the second set against Jaziri but insisted he will raise his game for the next match. He won the tournament here in 2009, 2010, 2011 and 2013 and is hoping to lift the trophy again this year. It won’t be easy against the Spanish star, who himself is a two-time Finalist here. It will be interesting to see if Djokovic can maintain his unbeaten start to 2016 and make it three Tour titles from three tournaments. Keep coming back to tennis-update.com for regular news and updates on your favourite ATP and WTA players.